Saravana Kumar is an avid traveler who loves spending time in the mountains. He is the founder of India in Motion, a travel film studio with a goal to showcase the beauty of India’s landscapes to the world. Here is an interview that I did with him. Tell us a little bit about your life before and after India in Motion. I grew up in a small village near the foothills of the Western Ghats in Tamil Nadu. So I always had an affinity towards the mountains. After college, I worked in the IT industry for about 10 years but the lure of the mountains was too strong. I quit my job in 2010 and have been drifting ever since. In the first couple of years after leaving my job, I creating a travel portal, kettik.com, but slowly realised that if successful it would be counterproductive and take away the very freedom I was seeking. Right around this time, I discovered the beauty of time-lapse photography and India in Motion was born. 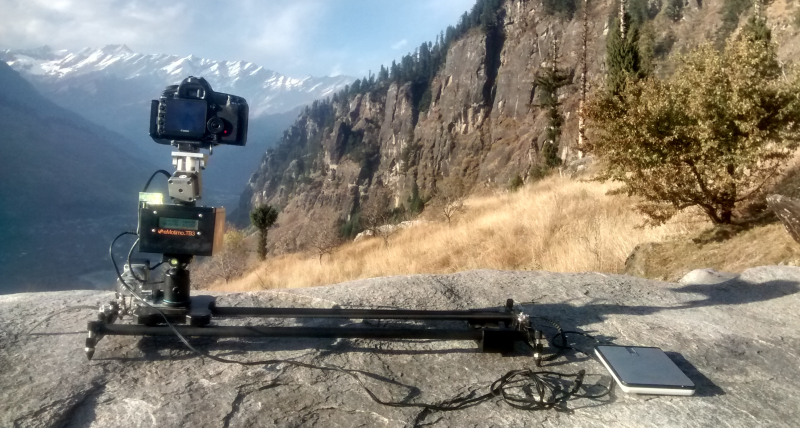 So far it has been a blast making the time-lapse videos for India in Motion. I feel that I have finally found my calling in this life. Financially it has been a struggle since the freelancing projects I get are very few and far inbetween. But I plan to stick to making these videos no matter what and with time my financial situation should get better. Apart from creating time lapses, what else does India in Motion do? Currently India in Motion is specialising only in time-lapse videos. I create time-lapse both for my personal projects and commercial assignments. The footage from my personal projects are offered as stock videos for licensing. I plan to build a comprehensive library of stock video footage from all across the country. But I don’t want to be restricted only to time-lapse videos. My ultimate goal is to be a independent travel filmmaker. To create videos that inspire people to travel and experience these places for themselves. Time-lapse footage is just the first step towards achieving that goal. I’am working towards incorporating aerial footage in my videos and even 360 degree videos in the future. How do you choose your locations for your time lapse projects? What do you look for in these locations? Typically, I like to spend atleast a couple of months in one region to full experience it. Experiencing life in a place is more important for me than to just go there to shoot photos and videos. So I make plans based on seasons. Like for example. I plan to spend the coming winter in Ladakh. Spring in Spiti, Summer back home and Autumn in Kinnaur. That is my rough plan for the coming year. Each of these regions will have a few iconic locations. So I make a plan to hit most of them. I also get inputs from the locals about hidden and offbeat locations in the area (shepherds have a treasure trove of information about the mountains) and cover them as well. The challenge with time-lapse photography is that it requires a lot of prior preparation and anticipation. Like for example, If I want to capture the full moon rising from behind the mountains. I need to know where exactly the moon would rise and at what time. Spending a few days at a location helps. You can notice such events on the first day and plan the shoot for the next few days. These days there are many smartphone apps that help you in this regard. I use an app called ‘PlanIt! For Photographers’. Using the app I can generally pinpoint the movement of the sun and moon in the sky and plan my shots accordingly. These apps are very helpful if you are in a hurry, but I generally prefer the traditional approach of getting to know the place firsthand to plan my shoots. To capture time lapses, you need to spend a lot of time outdoors. How do you manage that? I have always enjoyed being in the outdoors. Time-lapse photography gave me the perfect excuse to continue doing it. I’m constantly strapped for cash since I quit my job. I do a lot of hiking and hitchhiking to save money. Which means I carry all my gear and food to last me anywhere between a week to 10 days in the outdoors. My backpack weights between 25 to 30kgs and that is a lot of weight when you are hiking in the mountains. As a result, I’m very selective about the gear I carry. I use a lightweight but very very sturdy singly person tent. Similarly my down sleeping bag is light while still giving me enough warmth at temperatures around -15C. These are the 2 things that will keep you safe in the mountains, So I pay as much importance to them as my photography gear. I used to read a lot of books while camping. But these days time-lapse photography keeps me busy. Daytime is spent for cooking and scouting for the morning and evening shoots. Once I find the perfect spot, I like to pitch my tent right on location so that I can shoot my sunrise/sunset sequences right from the comfort of my tent. Like I said, It pays to have a really good tent that can be pitched anywhere out in the open. I do not carry a second camera, so I sit back and enjoy the scenery while my timelapse sequences are being shot. I find it very liberating not to own a second body, because most times we are slaves to camera and are constantly looking for new and interesting things to shoot. I do not listen to music and prefer to listen to the silence of the outdoors. There are exceptions of course and I play music during some very cold evenings and nights to keep my feet moving when I wait for the timelapse sequence to complete. Elvis is great for this. Another challenge while camping is to not run out of batteries. Good old DSLRS work great for this purpose. I carry some 3 to 4 spare batteries and a couple of high power USB battery packs. Coupled with a USB charger for Canon batteries, I can easily spend a week to 10 days camping without having to worry about running out of juice. Camping is not popular in India and many do not consider it safe. What are your thoughts based on your experience? In my opinion camping is one of the safest activities there is. 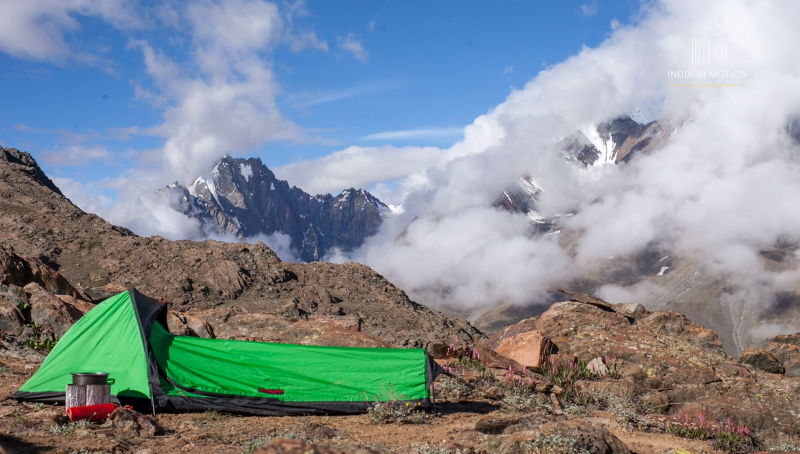 Most people associate camping with trekking, but camping can be an activity all its own. It is one of the most relaxing things you can do in the mountains. Just pick a place you love, pitch your tent and soak in the surroundings for a few days. Now with companies like Decathlon, getting access to good camping gear is easier than ever. However, I have mixed feelings on this subject. Barring a very small percentage, most of the people in our country are not very environmentally conscious. For them camping is about comfort. About bonfires and singing and drinking. They don’t really respect the sanctity of the outdoors and end up trashing it. Most outdoor companies, in search of a quick buck, encourage this sort of behaviour. And most of them never clean up after their clients and leave half burnt trash all over the place. The solution, I feel is to encourage people to travel and trek independently. People who spend that much effort getting to a place seldom disrespect it and I hope that they would leave the place as pristine as they found it. An instant review of time lapses is not possible, unlike regular photographs. You need to wait to get back to a computer to put together the time lapse. How do you manage this on location? 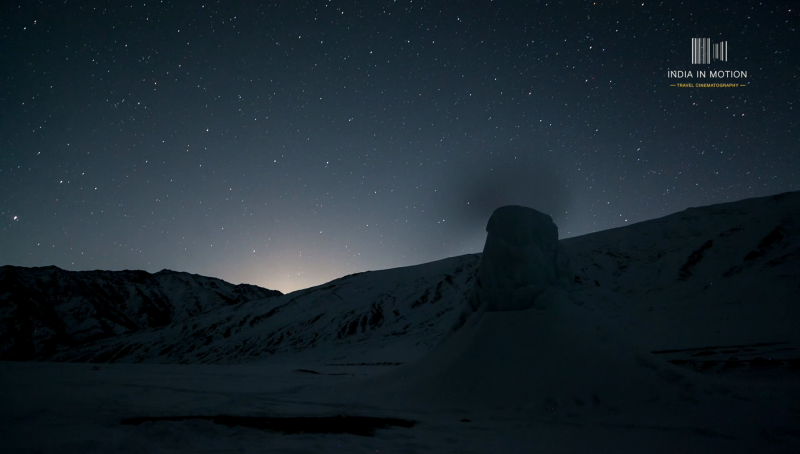 Reviewing time-lapses is not so different from regular photographs. You are basically taking a moving photograph. So the basic parameters that need to be reviewed are the same. Take a single image from the sequence, Check its focus, Check Exposure, Histogram and mostly you are set. But it is always nice to have a preview of the final video. To see if the elements in the time-lapse are moving too fast or too slow. I have the Magic Lantern firmware installed in my camera. It has a handy playback mode where the images in the memory card are displayed at 24 frames per second. It is a great feature to have and I use it all the time to review my time-lapse sequences. What sort of gear do you carry for creating time lapses? I use a Canon 5D mark II and a couple of Zeiss prime lenses (21mm and 50mm ZE). I enjoy using manual focus lenses for my photography and they make even more sense for time-lapses. The camera body is overdue for an upgrade and I’am planning to use the opportunity to go smaller and lighter with a mirrorless setup. The new generation cameras with their ISOless sensors and improved dynamic range are a godsend for time-lapse photography. And so is (some of) their ability to run on USB power. The other major gear I use is the eMotimo TB3. It is a 3-axis time-lapse controller which lets you incorporate pan, tilt and slide movements in your time-lapse videos. I pair it with a DIY motorised Carbon Fiber slider for my sliding movements. The DIY build was simple. I just needed to figure a way to mount a stepper motor to the carriage of my slider and use it to drive a timing belt. It works well. But like with most DIY fixes, the end result is not as polished as when using purpose built gear. Can you share some interesting incidents from any of the time lapse projects that you worked on? There are quite a few. But since i’am heading to Ladakh next. I will share a couple of incidents from my last winter trip to Ladakh in 2015. 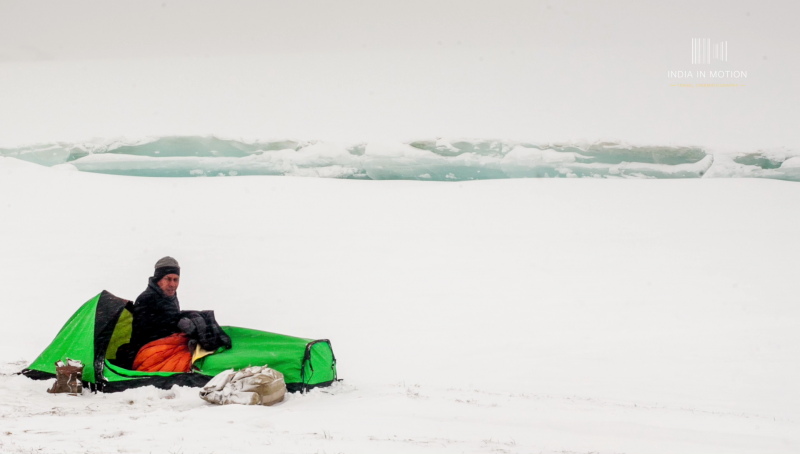 My most unforgettable moment from that trip was getting stuck in a blizzard on the shores of the Tsomoriri lake. Me and a friend went camping near the lake and it started snowing one morning. The snow continued to fall through the day and by late afternoon the wind picked up as well. Soon we were in a whiteout with howling wind and snow all over. It was a like a scene from the movies. I throughly enjoyed it. But the night was terrifying with very strong winds which threatened to tear my friend’s tent apart. I moved into his tent and we both spent the night braced against the tent to keep it from tearing apart. Luckily it didn’t and we had a great experience to remember for the rest of our lives. The winters in Ladakh are so cold that even the hot springs in the region freeze. I wanted to capture a few good timelapse sequences of these hotsprings. Not satisfied with my daytime shots, I wanted to capture the full moon rising from behind these frozen hotsprings. But the weather was overcast and the nights were cloudy. So I camped next to the hot springs for 3 days waiting for the weather to clear. Finally on the 3rd day the weather cleared and I setup my camera for the time-lapse sequence. It was very cold that night (ironically the clear days are the coldest in Ladakh) and my camera batteries died much earlier than I anticipated. So I didn’t get the shot I wanted after waiting for 3 days. And to add insult to injury I got minor frostbite in my toes and couldn’t walk properly for the next 5 days. 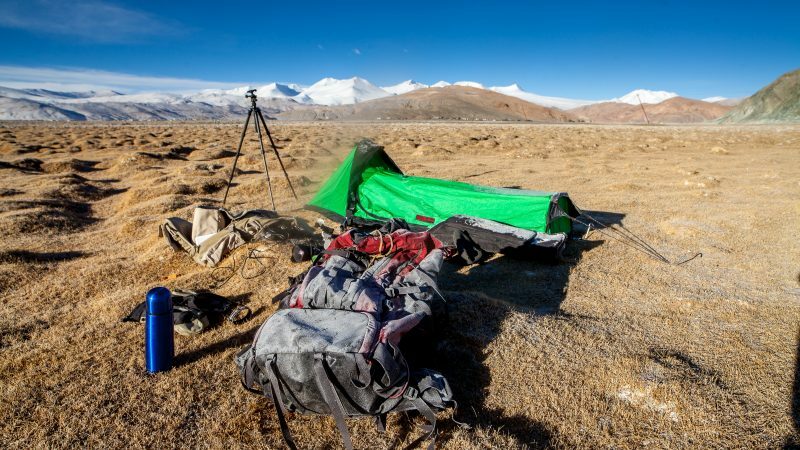 You have shot a lot of time lapses in the Himalayas. Which other places in India are on your radar? There is so much to see and explore here in the Himalaya. I feel that you can spend a lifetime here and still not cover it completely. Having said that, I would definitely love to spread my wings. I’am drawn to places where people live in tune with the environment surrounding them. Places where people are predominantly nomadic. Mongolia is on the top of my list. And so is most of Central Asia. I would love to explore that region once i’am satisfied with my work in the Himalaya. According to you, which is the top 3 offbeat places In India that amateur time-lapse lovers can visit? Thats easy. Ladakh, Spiti and Rajasthan. Ladakh because its wide open landscapes are the easiest place to get your compositions right. 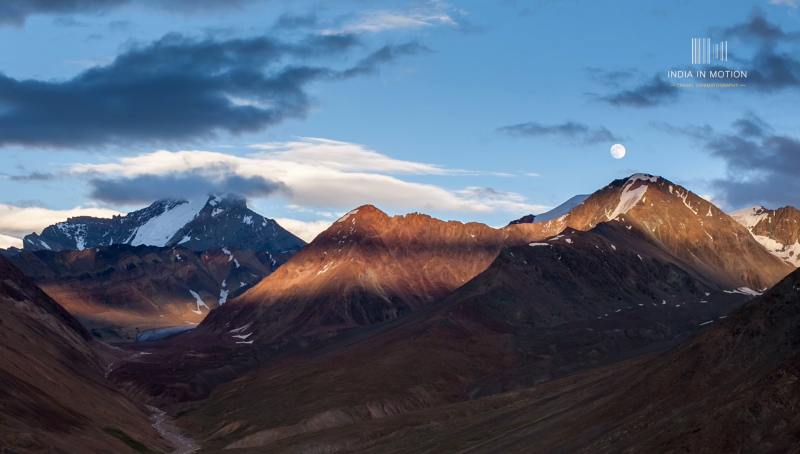 Spiti is similar, but a lot less touristy and a great place to capture sunrise and sunset time-lapses. I threw Rajasthan in there because i feel that its majestic forts would be a great subject for time-lapse videos.